The Eureka variety is available year-round, while the Lisbon is generally available only during the winter months. Extract more juice from a lemon by slicing when at room temperature or by rolling it under the palm of your hand on a flat surface before slicing. Use juice and shaved zest in drinks, salad dressings, or marinades, and sprinkle lemon juice on cut fruit to prevent browning while adding a hint of flavor. 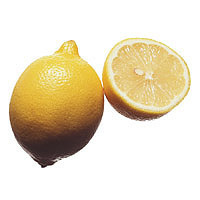 Lemons are an excellent source of vitamin C—especially important in the winter months.